Come and experience the magic of Welcombe at our Open Studios this summer. See new work from a selection of painters, portrait artists, furniture makers, potters, textile artists and photographers. 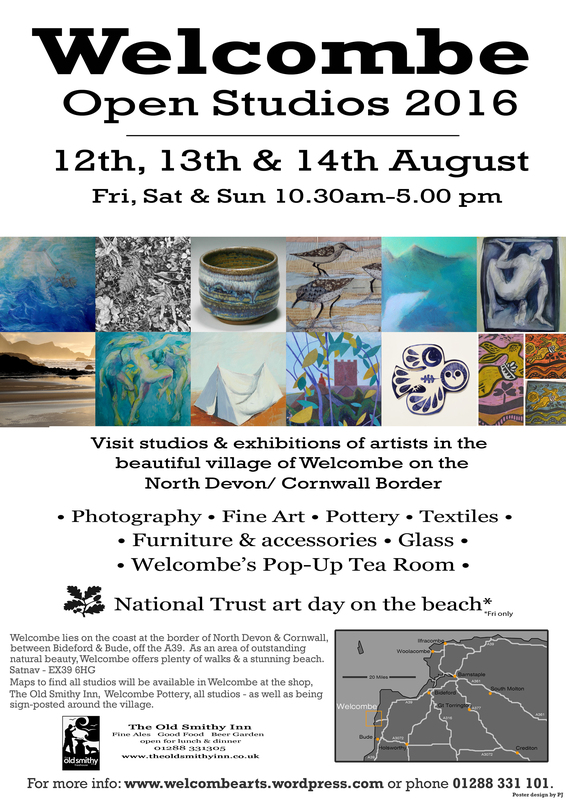 Some showing work directly from their studios and others exhibiting in the lovely village hall along side the famous Welcombe POP-UP tearooms. The artists are – Painters – Becky Cohen, Karen Gimlinge, Kim Mudge, Peter Stiles, Rick Hall and Richard Stevens. Furniture by Pacha Design. Potters – David Westcott and Alice Gare. Textiles- Nicola Waltho, Photography – Paul Jenner. Drawings – Alison Hutton. Sculptor – Tom Hyde. The Tea Rooms is organised by Alison Stubbs.